Writers love to explore "what if" scenarios based on the idea of alternate realities. Alan Moore's Watchmen depicts an alternate reality in which the U.S. won the Vietnam War. In Quentin Tarantino's Inglorious Bastards, Hitler is slain by a Special Forces unit. Downloadable content for the Assassin's Creed III video game sees a corrupt George Washington crown himself King of America. As outrageous as these scenarios sound, there are some scientific grounds for believing that such realities can exist. Physicist Hugh Everett developed the many-worlds interpretation of quantum mechanics, which suggests there exists an infinite number of different universes in which everything that could have happened in the past has happened. Effectively, every possible outcome for any given event is represented in another reality. The Season 3 episode "Remedial Chaos Theory" of the comedy series Community illustrates this concept as well. At a housewarming party, a group of seven friends is seated at a table for a game of Yahtzee when the buzzer rings -- the pizza has arrived. Group leader Jeff proposes that he'll roll a die to determine who has to go downstairs to fetch the pizza, to which genre-savvy Abed warns, "Just so you know, Jeff, you are now creating six different timelines." Every potential outcome of the die roll would result in a different group member fetching the pizza, and the act of rolling the die represents a point at which the current timeline branches off into six different outcomes. The episode goes on to show the outcome of each possible die roll and how a seemingly innocuous decision like who gets the pizza can result in dramatically different (and hilarious) outcomes. This alternate universe theory is also an exemplification of Edward Lorenz's butterfly effect in chaos theory. The die roll represents a "point of divergence" -- a time at which two or more universes stop sharing the same history and evolve along different paths. While Community's example leans toward hyperbole, consider the fact that every day, we each make innumerable small decisions that also constitute points of divergence. Do I hit the snooze button? Do I skip breakfast? Do I try to run that red light? Do I wish the new secretary a good morning? Do I have lunch with my boss? Do I work overtime? Do I order a pepperoni or vegetarian pizza? Then take into account the fact that everyone else is also constantly making micro-decisions, creating their own points of divergence, and we can see how the number of alternate realities quickly becomes too staggering to fathom. Now, not every decision will necessarily lead to a drastic difference between realities, and it is more likely that the cumulative effect of the decisions of multiple individuals will result in the greatest discrepancies. 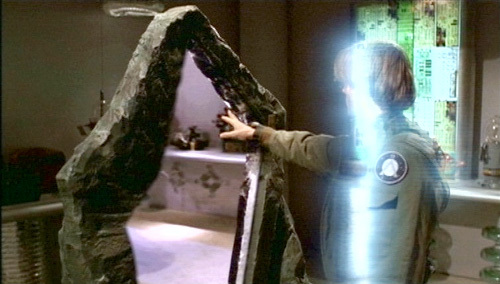 For instance, the Stargate SG-1 episode "There But for the Grace of God" depicts a dismal alternate reality in which Earth is currently under attack from an overpowering alien threat. What precipitated this circumstance? The changes we observe in this alternate reality include things as innocuous as characters having a different military rank and two of the protagonists being engaged, to things with more obvious far-reaching effects, such as the exclusion of two key members from the Stargate program. Is it because Dr. Jackson declined his initial invitation that Earth is now in peril? Perhaps, but it is more likely to be the result of the sum of the micro-decisions made by a greater number of individuals. But Wait! There Is Even More Science! Hugh Everett's many-worlds interpretation of quantum mechanics wasn't conceived to explain the fiction of alternate reality; rather, it was intended to explain the correlation paradoxes of quantum theory. Take the famous double-slit experiment, which revealed that light behaves as both a particle and a wave. When light passes through the double slit, we can apply an equation of wave-like behavior to identify where the light particles are likely to be observed. In this case, imagine light as the wake left by a ship at sea -- our equation tells us that the light particles can be found anywhere within the resulting waves. In fact, a fundamental principle called "quantum superposition" holds that the particles partly exist in all their theoretical positions simultaneously. But when we actually observe the particles, they appear in distinct locations. Hugh Everett's interpretation suggests that a separate reality exists for every possible particle location within the wave. 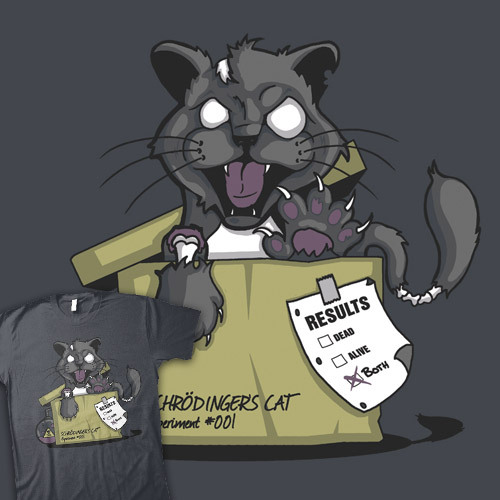 Perhaps the most popular quantum paradox is SchrÃ¶dinger's cat, mentioned multiple times in TV comedy The Big Bang Theory. This thought experiment posits a test in which a cat is placed in a sealed box, and the occurrence of random quantum event -- in this case, the radioactive decay of a single atom -- releases a poison that kills the cat. At any given time, the cat is either alive or dead, depending on whether or not the atom has decayed yet, and the traditional Copenhagen interpretation of quantum mechanics suggests that the cat is both alive and dead until the box is opened. It is the act of observation that forces either one state or the other. Hugh Everett's interpretation resolves this paradox by means of a point of divergence in which both states continue to exist, albeit in separate universes. An alternate reality in which a particle of light exists three millimeters to the right may not make for exciting fiction, but this is the scientific foundation that makes parallel universes a theoretical possibility. If multiple universes exist which exhibit these most minute of differences, then, surely, the cumulative effects of these minute differences will eventually lead to drastic discrepancies -- such as Hitler getting his face shot off with a submachine gun. The concept of parallel universes existed in fiction long before Hugh Everett formulated his interpretation in 1957, but thanks to his and other multiverse theories, the concept is no longer purely philosophical. To quote Oscar Wilde, "Life imitates Art far more than Art imitates Life."